Yes, you read that right! On January 19 at 7p in Moorhead, MN (Courtyard by Marriott – (Courtyard Fargo Moorhead, MN) 1080 28th Ave South, Moorhead, MN 56560) a 2018 Ice Castle 8′ x 16′ v-front, single axle, fish house will be sold to the public regardless of price as part of Minnesota State Auctioneers Association Fun Auction. 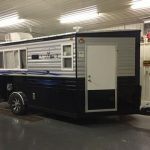 This fish house was built new on January 2, 2018 and features a crank down frame, (2) propane tanks, black and silver in color with blue accent, bay window, diamond plate rock guard all around, roof air, (8) holes and hole lights, bunk bed and dinette, camo interior, jack knife leather sofa, (2) sky lights, microwave 3-burner stove and oven with hood, refrigerator, bathroom, lots of interior lights and storage, surround sound system (CD and bluetooth ready). And, best of all it sells regardless of price to the highest bidder! If you can’t attend in person and want to bid, please contact Paul McCartan (515) 320-7600.